Rabies virus (RABV) is adapted to growth in the nervous system and in polarized neurons, but can be grown in conventional cell culture including popular cell lines which facilitates studies on basic aspects of the virus’ life cycle, including transcription, replication, virus assembly and budding, studies in polarized neurons are required to reveal the typical and specific traits of RABV. 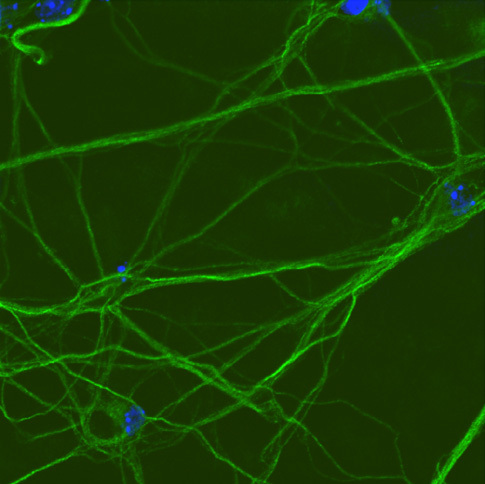 Left: In vitro differentiated GABA-ergic neurons stained with antibodies recognizing the neuronal marker beta-III tubulin. Using conventional cell culture, the RABV matrix protein M was identified in our lab as responsible for shaping and budding of virus particles and as a regulator of viral transcription and replication. The RABV glycoprotein G was identified as dispensable for virus assembly and budding, but essential for infectivity, axonal transport, and transsynaptic transmission. To extend our studies to neurons, we have established protocols for feeder-free culture of mouse embryonic stem cells (mESC) and in vitro differentiation to neurons. 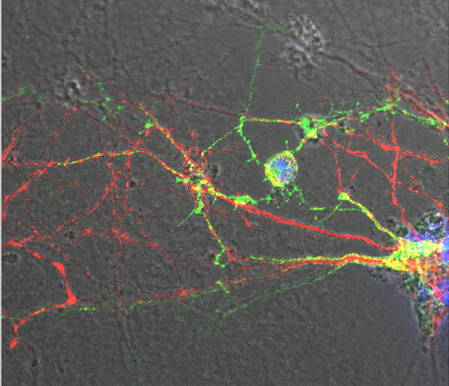 Using labeled virions or fluorescent protein-expressing viruses we are studying the mechanisms behind the exclusive entry of RABV at axon terminals, retrograde transport in axons, and the exclusive transsynaptic transmission of RABV. Candidate host genes involved are edited by the CRISPR/Cas9 system either in neuronal precursor cells or differentiated neurons. Unlike most viruses, infection of neurons with RABV does not cause rapid and overt cell damage, such that neurons remain viable and functional for weeks. We therefore aim at revealing the “neuroprotective” mechanisms of RABV infection as well as the interference with cellular signaling, leading to neuropathogenesis. We are using isogenic viruses carrying individual mutations to address the contribution of virus proteins to neuronal signaling, dysfunction, or death. These studies involve a broad range of up-to-date high-content technologies, bioinformatics, and genome editing, and are relevant with respect to the understanding of neurodegenerative diseases in general.